Ignacio "Nacho" Coronel, a top leader of Mexico's Sinaloa drug gang, was killed in a military raid in the suburbs of the western city of Guadalajara, according to media reports. The military targeted Coronel, a close partner of Mexico's most wanted man Joaquin "El Chapo" Guzman, in a raid in the suburb of Zapopan on Thursday, the main Mexican newspapers reported. 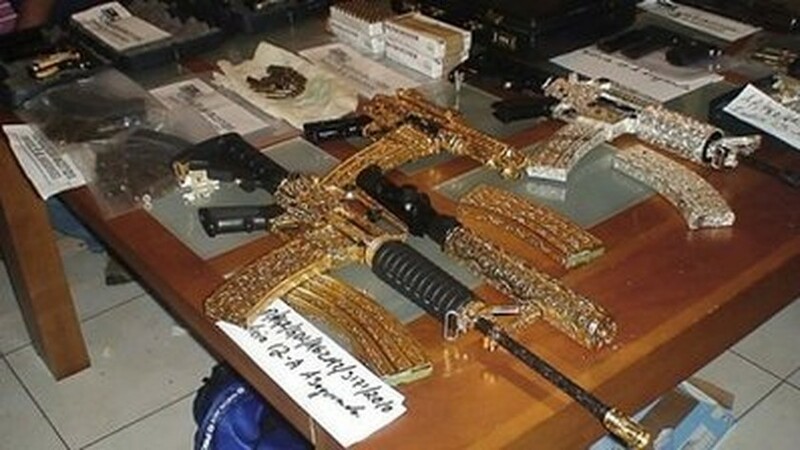 Handout picture released by Mexico's Attorney General Office in May shows gold and silver-plated, diamond-incrusted guns believed to belong to allies of the powerful Sinaloa drug gang, seized by Mexican security forces in Zapopan, Jalisco. A military source confirmed the raid to AFP but declined to give more information before a news conference scheduled for 7:30 pm (0030 GMT Friday). Coronel is also known as the "King of Crystal" for his dominance of crystal methamphetamine production and trafficking as well as cocaine. The US and Mexican governments both have outstanding arrest warrants for him, while US authorities had offered a five-million-dollar reward for information leading to his capture. One of Coronel's nieces reportedly married Guzman, the fugitive head of the Sinaloa gang, in 2007.